They call walking the “perfect exercise.” It gets your heart pumping, clears your head and fills your lungs with fresh air. Not bad, but we found a way to make it even better. Before you take your next 10,000 steps, add a little strut to your stroll. Take the Greyhound Walking Stick anywhere and I promise that you’ll feel like a conquering hero. Heads will turn. Doors will open. Its powers will astound you. 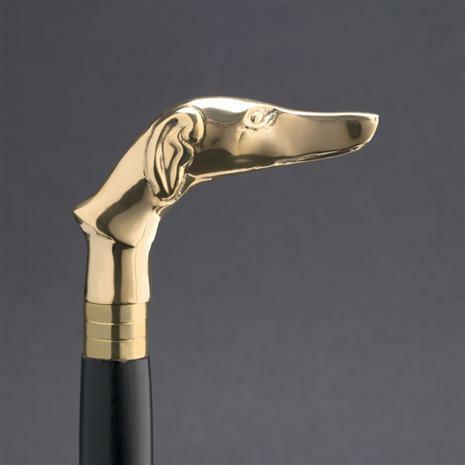 The Greyhound Walking Stick was designed, created and crafted in the style of those ornamental, collectible canes of yesteryear, but built to be used every day. The black lacquer-finished wooden body is sleek and stylish, and once you grip it you’ll understand that this is no hollow imitation. Envious onlookers’ attention will be drawn to the carefully crafted handle, where a gold-finished greyhound’s head design sits proudly. Available in 36" & 40"